The deary cold days of winter are behind us, the sun is shining, there is new life and growth all around. After months of being cooped up in inside, we are all itching to get outside, enjoy the outdoors, and feel the sun shining down on us. The kids are bubbling with excitement as they get reacquainted with their favorite outdoor activities and toys. I watch on as they rediscover the great outdoors, remembering similar experiences from my childhood. Some of my favorite childhood memories are times that mom just let us be kids and play. We climbed trees, rode our bikes, built grass houses, explored nature, and got dirty. Little did I know that I was benefiting from being outside. Our kids don’t live on a farm with lots of acres to explore like I did growing up, but there are still plenty of simple ways they can get outside, have fun and be kids without costing you anything. 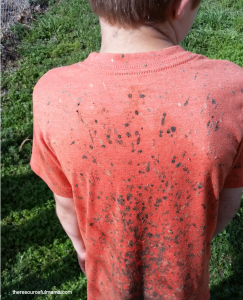 Our kids love to play hard and get dirty, the muddier the better. We want our kids to be kids and have fun. 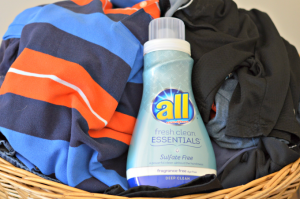 Thankful, I can rely on all® fresh clean Essentials™ to get their clothes clean. It offers powerful cleaning without any of the harshness while maintaining the color of our clothes. I was thrilled recently when I learned that it now comes new sulfate free product! Two members of our family have sensitive skin, so we made the switch to sensitive skin, fragrance free products a couple of years ago. We have slowing been moving to sulfate free products as well. Best of all I could order all® fresh clean Essentials™ from Amazon and have it sent straight to our front door. Be sure to follow the directions for use exactly on the packaging. Are you left with small broken pieces of sidewalk chalk? 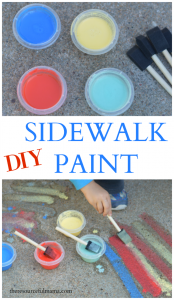 Turn these pieces into DIY Sidewalk Paint with just a couple quick steps. Smash your sidewalk until it is ground up, mix with water until desired consistency, and stir. Add some paintbrushes and the let the fun begin. Kids love this departure from the normal sidewalk chalk. 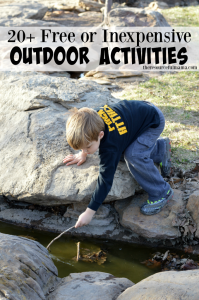 Share your kids’ favorite outdoor activities in the comments below. LOL! My daughter loves riding her scooter though puddles – muddy ones included! Looking forward to trying this chalk paint idea!